Another in my series of super quick and easy Christmas cards using the Memories & More Card Pack - Merry Little Christmas. 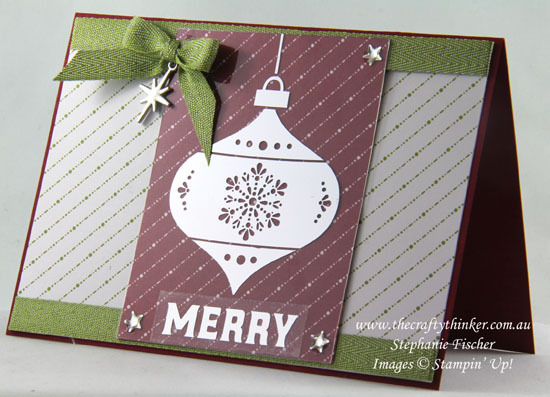 Merry Little Christmas Memories & More Card Packs are fantastic for quick, easy Xmas cards! The base card is Cherry Cobbler. To that I added one of the cards with an Old Olive pattern, trimmed to size and with lengths of Old Olive ribbon adhered top and bottom. I placed the acetate sheet with the silver decoration on top of one of the smaller cards, using glue dots in the corners to keep them together. I then lined up the stripes and adhered the piece to the front of the card with Stampin' Dimensionals. I placed one of the stickers (Merry) under the bauble and silver stars cover up the glue dots in three of the corners. I placed an Old Olive bow in the top corner from which dangles one of the gorgeous new Year of Cheer Embellishments. I attached it with a length of Silver Metallic Thread but a glue dot would do the trick! All finished in a matter of minutes with minimal supplies and equipment!